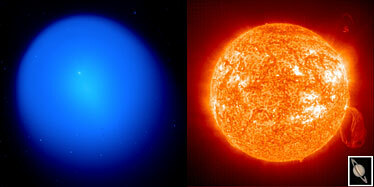 A comparison of Comet Holmes, the sun and Saturn (inset) is shown in this image from the University of Hawaii. Once a faint, obscure comet, 17P/Holmes has eclipsed the sun as the largest object in the solar system and it's still growing, Hawaii astronomers say. The spectacular comet has dazzled astronomers since it exploded Oct. 24 from a tiny nucleus of ice and rock about 2.2 miles in diameter. On Friday, the mass of ejected dust was measured at 900,000 miles across by Rachel Stevenson, Pedro Lacerda and Jan Kleyna of the University of Hawaii Institute for Astronomy. They used observations from the Canada-France-Hawaii Telescope on Mauna Kea, which has a wide-field camera capable of capturing the whole comet in one image, the astronomers said. Also participating in the research were astronomy professor David Jewitt, researcher Nuno Peixinho and graduate student Bin Yang. People can see the comet as a fuzzy object with the unaided eye but it's much better with binoculars, Jewitt said. The comet is expanding at about 1,100 mph and is "an unprecedented million times brighter" than before its outburst, UH astronomers said. The comet's nucleus appears as a white "star" near the center of the cloud of dust on the image. A tail also is starting to grow, the scientists reported. Jewitt said about 10 million tons of dust erupted from the comet. "It's like something broke on the nucleus and all this stuff poured out into space," he said. The comet was discovered in an outburst in November 1892, then faded and burst again in January 1893, he said. Both outbursts were almost the same size, Jewitt said, explaining they probably occurred when the comet was at its closest to the sun and were triggered by the sun's heat. The IFA team will continue observations from Mauna Kea in case the comet follows the same pattern as it did more than 100 years ago, he said. "The comet is well placed in the sky for a long time so we'll be able to follow it from Mauna Kea for many, many months." 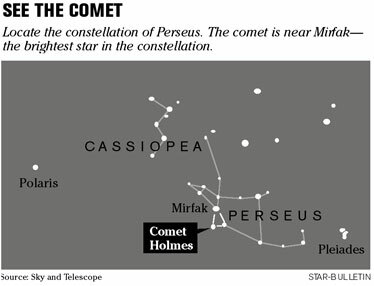 Comet Holmes, with an orbit period of about six years, is in a class of "Jupiter Family Comets" with orbits influenced strongly by Jupiter, the astronomers said. It's believed these objects orbited the sun beyond Neptune in the Kuiper Belt region for most of the last 4.5 billion years, they said. In a few thousand years, the astronomers said the comet is likely to either hit the sun or a planet, be ejected from the solar system, or simply run out of gas and disappear.